Every site owner desires to rank its website in the first page of search engines and tends to do SEOs wrongly. I see lot of people’s websites whose links are not even relevant for their websites. For an affiliate who knows what they do is good for them but, if you are a business owner and wants to grow your business then it is really a matter of concern and should never do this SEO mistakes. Building links from other websites is very good and helps in your search engine ranking, IF DONE IN A PROPER WAY. But if you use or register for a link building networks then you are in trouble. Though you might get links from big networks or websites but a lot of times you have to link to that websites and that website links back to yours. It’s just like a matter of give and take and this is very dangerous because Google can see these patterns very clearly and you may get penalty. So, make sure that you don’t go into a link building network. With new technologies and inventions some people this days try to fool and use text spinning programs. Text spinning are like pulling a piece of text and if the text are written quite well then they can spin out and create different variations from that content. The content that is generated are quite readable but Google knows that this is a duplicate content. This could probably place you in trouble, because if your content is seen as duplicate then Google will not index your content but will also count it as a piece of content or spam. Though you may write 1000 or 1500 words articles content, but if your content is not relevant to your topic and just bluff around then this is also a great mistake that you have been doing. Try to write a quality content and should not only go for quantity. Also you should not write contents only for search engines but you should also keep in mind about your readers. Because if you do not do that and merely write your content thinking only to rank your site then people will not click or read your entire content as a result this will be your one of the greatest mistakes that you are doing in your SEO campaign. 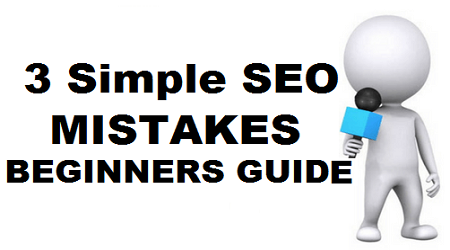 So, if you were doing all or one these mistakes then try not to do this 3 silly SEO mistakes and your search ranking will automatically get higher.